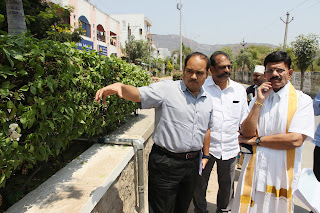 Tirupati, 30 Mar. 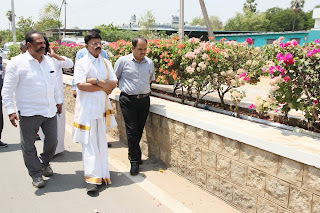 19: TTD Joint Executive Officer for Tirupati Sri B Lakshmi Kantham said that all the TTD promoted roads in temple city of Tirupati will be laced with green grass and flower cover and a bio wall will be set up as a part of the beautification. The JEO on Saturday inspected the TTD roads from Vinayaka temple in Alipiri road covering Garuda circle, Kapila thirtham to Nandi circle, Leela mahal junction, MS Subbulakshmi statue junction, Ramanuja circle, Lakshmipuram circle and TTD roads up to Ghantasala statue on Tiruchanoor road. 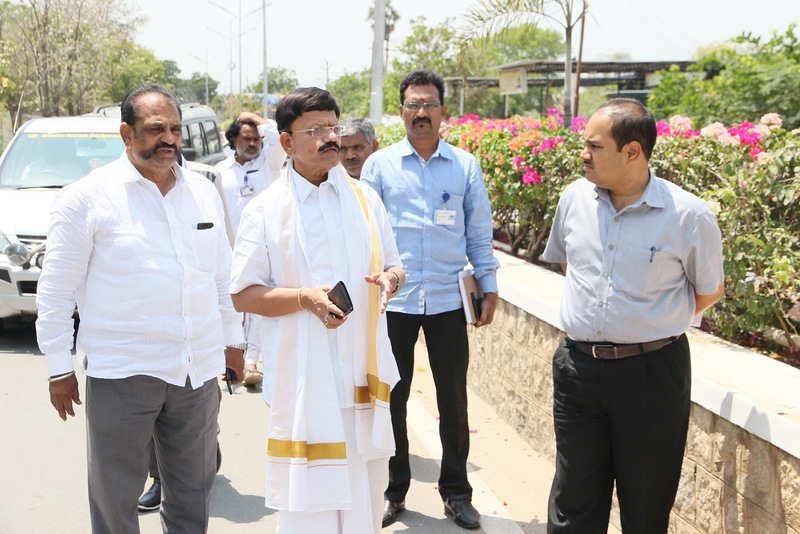 Speaking on the occasion, the JEO said green grass foliage would be developed on 8 km stretch of TTD road from Tiruchanoor to Nandi circle touching Garuda Bridge. 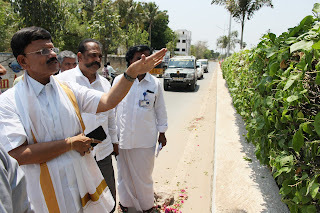 In the rest of 18 kms of TTD roads flowerbeds with Bougainvillea will be developed with shrubs and green foliage in between. He said on the entire 26 km spread of TTD roads in Tirupati, the TTD proposed to put up Srivari temple emblems of Shanku-Chakra-Namas with electrical decorations. In all 520 such emblems at ratio of 20 for each Kilometre are scheduled to be put up by April 25. 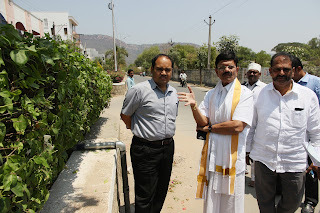 TTD DFO Sri Phanikumar Naidu, SE (electrical) Sri Venkateswarlu and VSO Sri Ashok Kumar Goud participated.